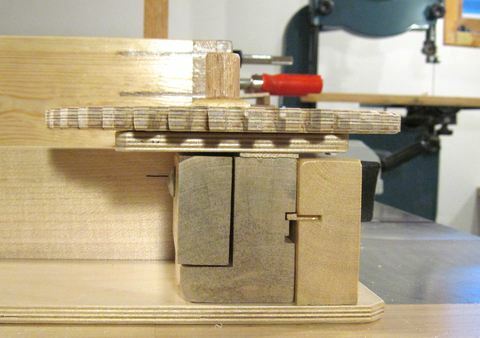 After I built my original screw advance box joint jig I ended up using it quite a lot. But over time, I realized the jig and plans could be improved on a bit. Primarily, I came up with a much better method of mounting the primary gears. 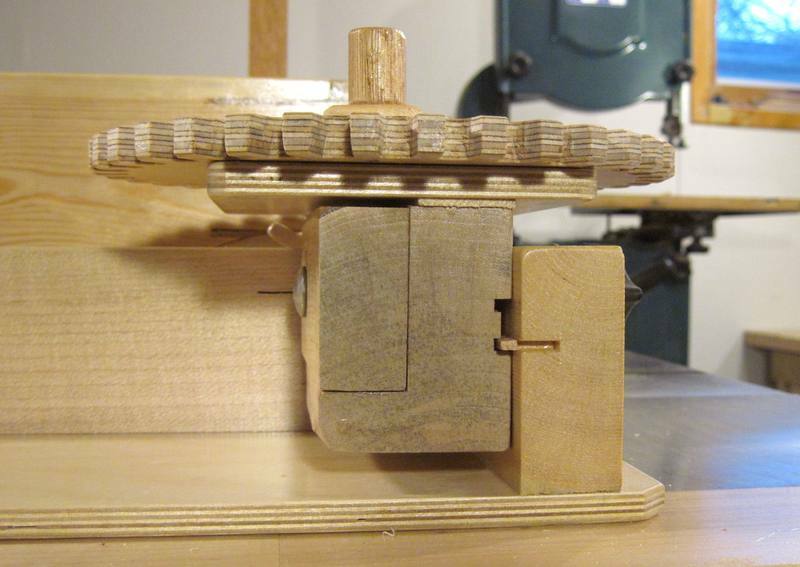 With my old jig, I had to make a gear mount block for each primary gear. But over time, I ended up making quite a variety of primary gears to hit some of those odd intervals that I needed for various types of joints. So a big improvement was to come up with a mounting system that didn't require separate blocks for each primary gear. Other improvements involved simplifying the design where I could, and tweaking dimensions to allow for deeper cuts without cutting into the jig. This is the improved gear mounting block. The gear mounting block has some clever elements to it. The block can be mounted at two different heights for meshing with the 12-tooth and 16-tooth gears. It also slides left and right to accommodate different sizes of gears ON IT. 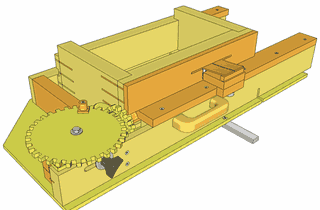 The gears are mounted by pushing the bolt through the gear and into one of two holes on the top. On tightening the plastic knob the block is locked in place and also clamps down on the bolt holding the gear, locking it in place. This makes for faster gear changes. 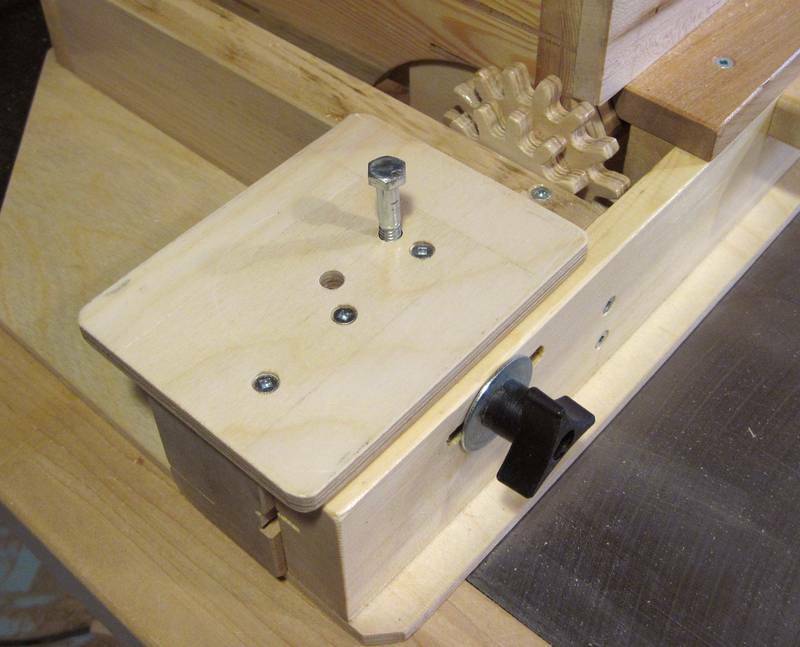 The block has two holes for the bolt holding the gear. For the smaller primary gears the hole on the right is used. The hole on the left is for the larger gears of up to 48 teeth.. This photo shows the block placed in the upper position. Note how the little piece of wood that is inset into the frame meshes with the lower slot on the gear mount block, whereas on the previous photo, it meshed with the upper slot. 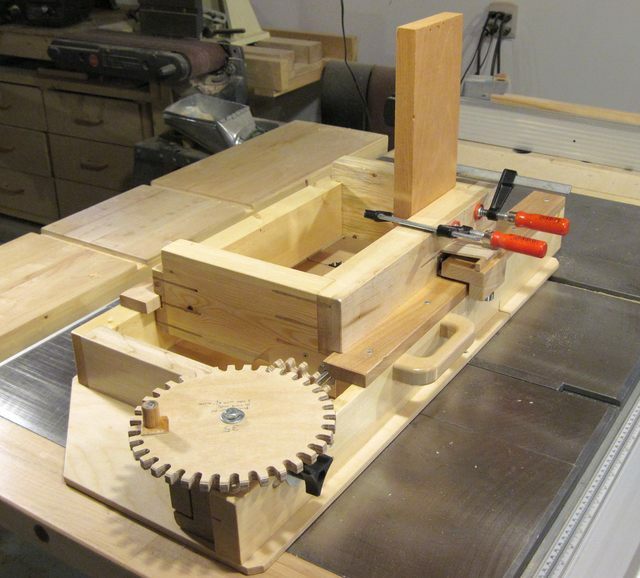 This video shows the box joint jig being used to cut a finger joint. A finger joint is essentially a box joint with very tightly spaced fingers. I'm using a thin kerf saw blade instead of a dado blade to make the fingers very narrow. Accuracy is very critical for this type of joint, so this is a good demonstration of what the jig can do. I have produced another video showing how I can use this jig to quickly cut a very accurate double tenon joint. Its not just for box joints!